Check out our Adoptable Cats & Kittens! Sweet Alana is a bit on the shy side and will take some time to warm up to new people. With patience her natural curiosity will not be contained and she will amuse you with her playfullness. Alexis is just about the perfect cat for the fun loving cat person. She enjoys playing with toys and she loves to snuggle with feline and human friends. 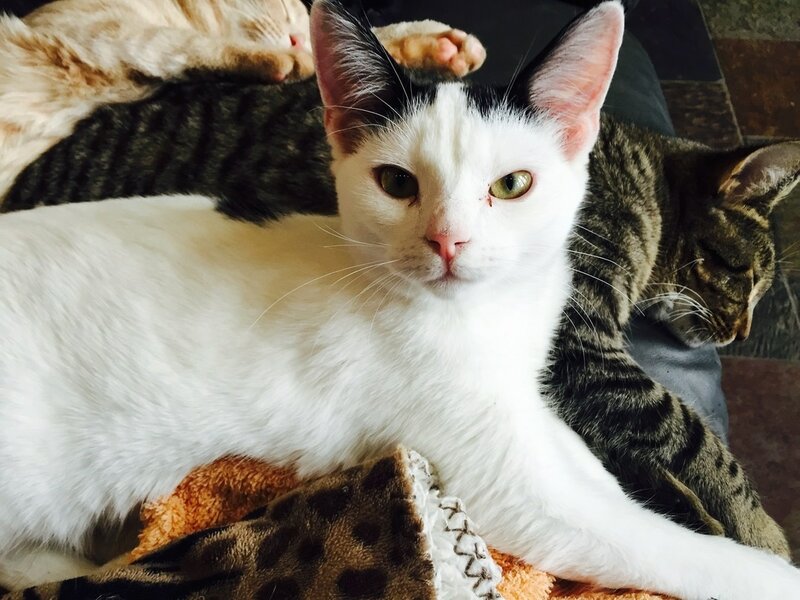 In this multi cat foster home ,there is not a single cat she does not get along with.At times she can be seen snuggling up to one of the dogs in her foster home,too. Anyone that says that cats are independent and easy to care for have not met Baloo. This unique boy is nonstop action and demands attention. While other cats are usually taking a mid-morning through afternoon siesta, Baloo is bouncing off walls. Don't let these pictures of him fool you; they were taken at a rare resting moment. In fact, if a fly or moth happens to enter your home, it won't be there long as Baloo is quite the acrobat and has caught many in mid flight. Having a hamster style cat wheel and an outside catio would be just some of the many recommendations for this boy. While it is advised that Baloo be the only animal in a home, he does well with cats that are not dominant but are confident and do not take any guff either. Due to his enthusiasm for play and the fact that he can play a bit rough, it is also advised that he not go to a home with young children. Baloo also has a heart murmur which is a condition that needs to be monitored. It hasn't affected his health and was noticed during a routine exam. 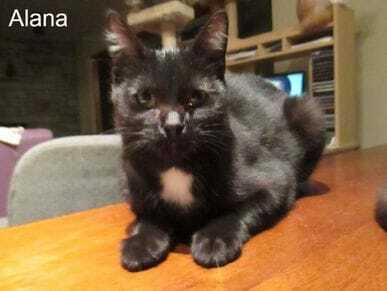 ​Benita is a very sweet, but shy young lady who does want to have another cat to play with in the home. She does best with cats close to her age and likes to snuggle up on the couch with them. Benita enjoys bird watching and a variety of toys. Chai was trapped with her brother Macchiato. She is still very shy, but what a beauty! Her little round face hosts large beautiful eyes that hold both uncertainty and a desire to be loved. She often finds herself wrapping herself around her foster mom's legs when canned food is brought to her, and is slowly getting better about being petted, but she is still quick to hide when approached. She will need a family that is very cognizant of her need for time in order to grow to trust. Dasher was trapped late this past fall as an older feral kitten. 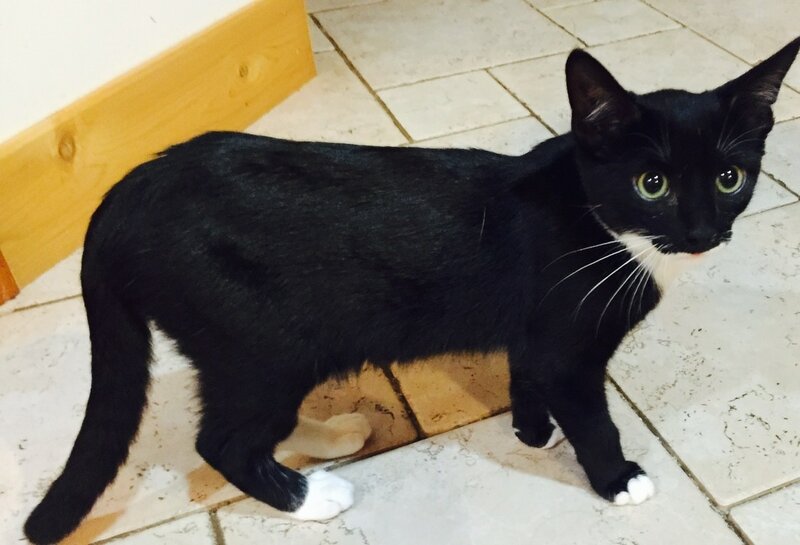 He is still quite timid and will need a very patient home to help him settle in. He has been showing his face more in his foster home and is such a handsome boy that hasn't known human care and touch before now. He does get along with other cats and kittens. Dorado is an inquisitive boy who loves being with his people. He follows them like he is their right-hand man. He loves his brother Fiji and his two sisters Ladora and Capri, and he got along with the older teens and cats in his foster home. However, it takes him time to warm up to new kittens. It is almost as if he doesn't like the thought of having any less attention detracted from him by another cute face. Evan is an all around fun cat. He is always ready to try out new things and loves playing with his foster siblings. He will need another cat to play with in his forever home. Evan is a very sensitive little guy and will need to be watched closely at first. When two of his foster brothers he was close to were adopted he wanted to stop eating and had to be strongly encouraged to eat. Gypsy was found wandering in a neighborhood, sick, emaciated, and covered with fleas by a family. When a plea was put out on Facebook for a home for this little girl, SMART Paws decided to help since a member was going that way the following day. After baths, medical care, and nutritious food, this little girl has blossomed. She can be a bit shy initially when first meeting a new person, but she loves to snuggle and follow people around once she gets to know them. She gets along with cats and kittens of all ages and is just an absolute doll. Jasmine was trapped in Dow Gardens this past summer as a kitten. She was very skittish when brought into foster care and took quite a bit of time to trust any human. Now this little girl is still wary of strangers, but she literally throws herself on her foster mom when she sits on the couch. She loves to lay on her "mom" when she lays down, and has just recently decided to frequent her foster "dad's" lap now, too. This strikingly beautiful girl will take some time to warm up to a new family, but once she does, you have a very snuggly girl. Java was trapped with three of her siblings. She is a sweet and precious little girl that will probably remain quite petite as an adult, but she is still a bit wary of strangers when they come over. She is pretty social with her foster mom, rubbing up against her legs, particularly when it is feeding time. When she purrs, her little motor lets you know how just how content she is. She has the potential to be such a loving little girl with a patient family who understands her need for time and security. Khenan was born in foster care on May 9th or 2016 and has a bigger than life personality. He quickly takes charge of situations and lets the bigger cats know that while he may be small, he is tough. He is an affectionate boy and always has a face that reflects the wonders of the world. Khenan loves to play and snuggle, and he is a perfect match for his equally energetic and life-loving brother Montego. Lakota came into foster care after being trapped as a feral kitten. He is slowly learning to trust the people around him, approaching for pats and treats. However, he still shies away from being held and startles at sudden movements or noises. 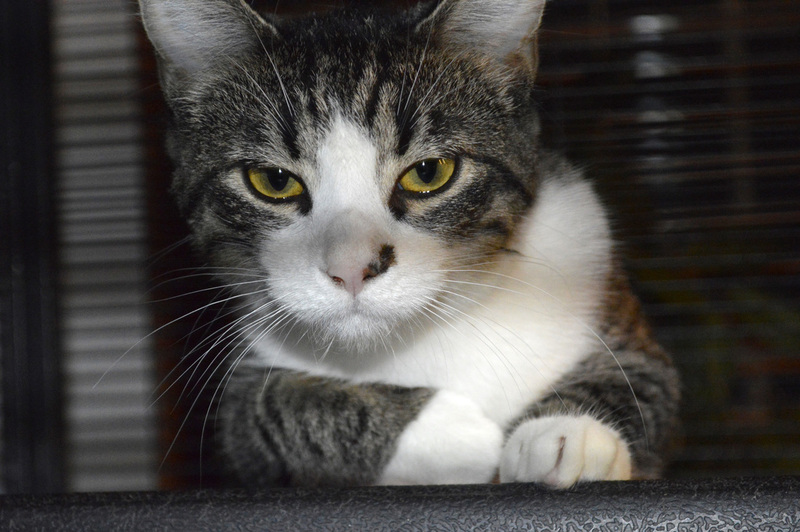 He is such a handsome boy that gets along with other cats and would probably do best in a quiet and stable home environment that is patient with the process required for him to acclimate and then take baby steps toward becoming that affectionate cat that he so wants to be. ​This little guy was presumed to be thrown from a car because his lower lip was torn down to his chin, he had a fractured jaw/chin, and his lower teeth were shattered. He managed to find his way to a kind Samaritan's house and with the help of another local rescue, we were able to get him seen by a local vet immediately and taken into foster care. While initially a bit head shy and terrified of riding in a car, this sweet fellow has made vast improvements. With the skilled work of the vet, Leno has a normal looking mouth with the ability to eat all kinds of food, although he doesn't have lower incisors. Canned food is the preference though, and he can become quite emphatic about getting his bowl filled. He wrestles with kittens his size and doesn't hesitate to do the same with a couple adult cats who have taken him under their care. Leno loves to play in cat tunnels and with balls on tracks. He is a fanatic about batting a cat toy across the floor like a soccer player, yet he is quick to snuggle up on a lap when evening falls. Little John was rescued from a car lot as a baby. He really does seem to appreciate meals he can count on, the warmth of a home and friendship with his foster siblings. Like with most kittens a home without other cats would not be suitable for him, as he loves to play. He enjoys cuddling up with his foster siblings and human. Little John has a nice purr and uses it even in anticipation of getting attention and love. ​Macchiato is a handsome boy who had to be trapped at the age of 6 months. He was brought immediately into foster care on August 31 and is slowly being tamed. He is very responsive when canned food is brought to him. However, he is still cautious, particularly when a new person walks into his area. He will need a patient family to adopt him that understand that it will take time for this striking cat to feel comfortable. He is good with other cats, but it is unknown how he is with dogs. MacGuyver is a very sweet boy who loves being with people.He is also very inquisitive and a big explorer . 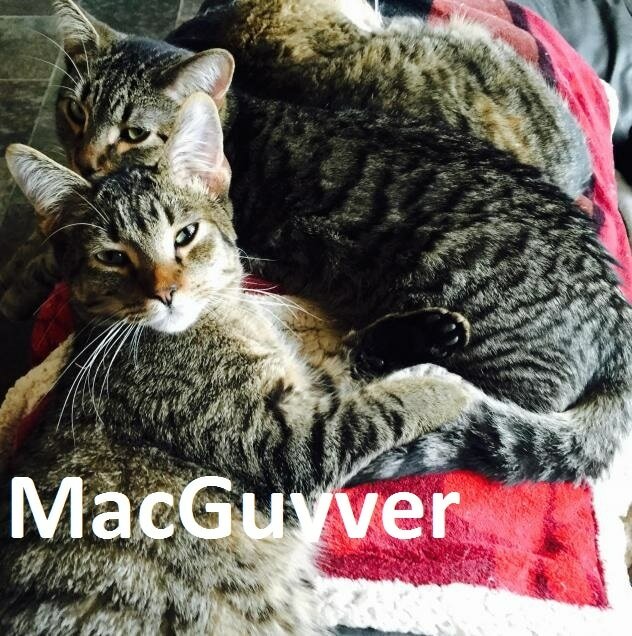 MacGuyver gets along with the other cats and kittens in his foster home.He also loves to snuggle with his human family,but especially loves his brother Magnum. Rosso and Mikesch are bonded brothers and need to be adopted out together. The ideal setting for these two handsome boys would be a secure indoor/outdoor home. Both boys enjoy playtime with each other and their foster sisters and brothers but shy away from people. Rosso tolerates being petted by his foster Mom and is the more outgoing one. Porky is such a darling boy and would love a stable, loving home where he can be the center of attention. Porky came into a shelter as a kitten found outside of a place of business with a severe urinary tract infection. He was taken into foster care about three years ago, only to develop a blockage. He required emergency surgery which meant that his ureter had to be rerouted so that he now urinates through a hole in his abdomen. It was also discovered that Porky had shattered one of his hips shortly afterwards, but that he was too young to have surgery. After six months of taking it easy, x-rays revealed that the hip had healed on its own with only a slight thickening of the bone. Despite having these two incidences occur so early on in life, Porky has a remarkable attitude toward life. He is very affectionate and easy going, and he carries on as if nothing had happened to him. The veterinarian did say that he might have an early onset of arthritis in the hip and corresponding leg, but with proper nutrition and care, the severity of it could be lessened. The area where he eliminates in his abdomen is prone to get irritated and infected, so care needs to be taken to check it frequently. Occasionally, if he gets stressed, he may dribble a bit when coming out of the litter box, but this does not happen very often. Quincy is a small little boy that thinks he is bigger than life. The first time he was able to go into the main part of the house with the "big kids," he just made himself at home. He is an incredibly sweet boy that wants nothing more than to be loved, have playtime, and have his belly filled. He is an incredible snuggler. Quincy loves life and could teach us all to appreciate the little things. He would do great being adopted with his sister Mavis, but he would get along with most any cat or kitten. While Rossi is timid in public settings, he is truly a wonderful boy at home. He gets along with every cat in the house and always welcomes newcomers. If he were human, he would easily be described as the empathetic negotiator. Rossi seems to know when another cat wants to engage in a game of tag and when one just wants to be left alone. He has brought toys to cats and gently played back and forth with them, but he has also wrestled with the best of them. Rossi's favorite game is chasing the laser pointer light. If he hears the toy coming out of its bin, he sits up like a little sentry and can barely conceal his excitement. Rossi got along well with his foster mom's elderly Malamute when he was a kitten, but he has not been around a dog as a cat. He would probably do well with a gentle cat-friendly dog. He would also do well with children, as he is a sweet boy. Stubsie is a very shy young cat who would do best in a household without too much commotion. She does like to spend time with the cats who do not show a dominant demeanor, but scares easily when one is too rambunctious. Stubsie likes lap time and one on one playtime. She is very petite with interesting coloring and big green eyes and would make a valuable addition to the right home. Tabby is a pretty and social five year old. She came into foster care as a sick girl, but is doing great and is steadily gaining weight. Tabby does require some medication, but takes it all in stride! She loves to cuddle in bed with you and sit on your lap. She also likes to talk and tell you about her day. Tabby lives with a foster family that includes kids, dogs, and other cats. Tegan is a very sweet 5-year-old girl who came into foster care after her person fell on hard times financially and felt unable to keep her. Tegan is often the first one to greet me when I get home from work and invites me with her soft meow to pet her or rubs up against my legs. She enjoys sitting on a lap as long as she is the one initiating it, as Tegan does not like to be picked up and protests at any attempts of doing so. She is in a home with several cats and 2 dogs and would likely do well in a forever home by herself or with a few other pets. Although Tiani was brought into foster care when she was just a little tyke with her mom and two siblings, she has always been a bit on the shy side and still has that sweet but delicate personality. Tiani wants so much to be loved and can be quite the snuggler, but she would do so much better in a quieter home where she doesn't have all the activity of various cats and kittens to contend with. Trinora is a gorgeous girl who has short little legs and a rotund body that just add character to her comical personality. While she can be a bit shy at times when first meeting someone, she can also show her true colors right off the bat by demanding attention, often pushing another cat out of the way to get it. If she gets ignored, she doesn't hesitate to tap you with a paw or gently mouth your arm or shoulder. While her favorite resting spot is on the top perch of a cat tree, she loves to saunter throughout the house with a medium-sized stuffed ground hog calling as if the next county needed to hear her. When you start talking to her, she drops her toy and comes swaggering over as if she has just done something worthy of recognition. Trinora may do okay with dogs of a low-key nature, but she doesn't care for a lot of activity and noise. Therefore, she would also do better with older children. She gets along well with teen and adult cats. Her age is estimated to be between 4-5 years old.